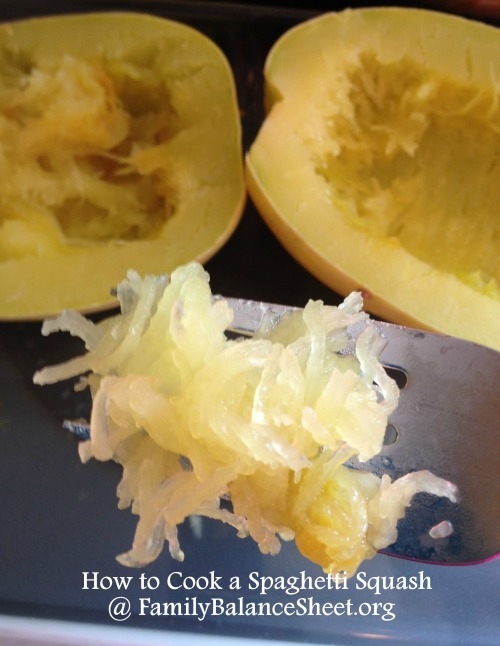 It’s uncanny how much cooked spaghetti squash looks like pasta. What’s even more uncanny is that my kids didn’t question that it wasn’t pasta. When they asked, “what’s for dinner”, I honestly said, “spaghetti squash.” They didn’t even flinch; they just gobbled it up like they do when they eat pasta. Cooking the squash takes about 45 minutes in the oven. Shred into spaghetti stings, toss with your favorite flavorings and dinner is served. It was easy-peasy. Once it is cooked, try my Tomato, Basil & Garlic over Spaghetti Squash. 1. 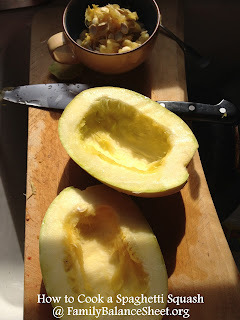 Spaghetti squash is a fall squash, so the rind is quite hard to cut into. Carefully cut the squash in half lengthwise with a sharp chef’s knife. 2. With a spoon, scoop out the seeds. 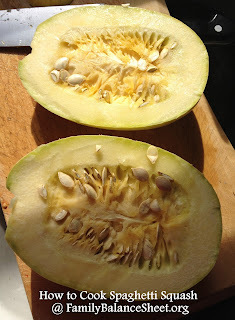 Discard the seeds (in your compost) or roast them like you would pumpkin seeds. 3. 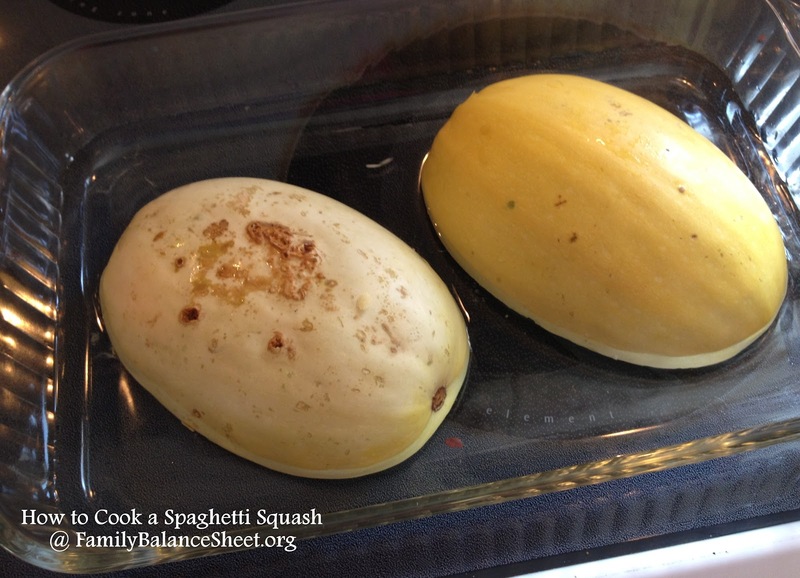 Place the squash halves cut-side down in a baking dish. Fill the dish with water, about 1/2 inch up the sides of the dish. Cover with foil. Cook 45 minutes in a 375 degree oven. 4. The squash is done cooking when a knife can easily pierce the rind. 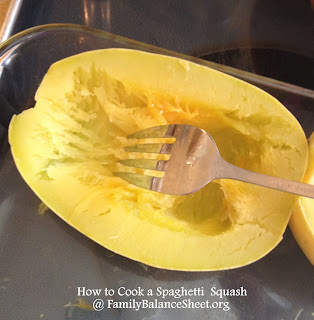 Carefully turn the squash over and drag a fork in the squash from one side to another creating the ‘spaghetti’. 5. Mix the spaghetti squash with your favorite herbs and seasonings and serve. 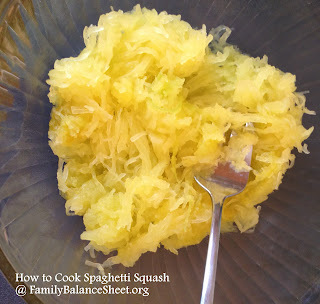 How do you cook spaghetti squash? Let us know in the comments. Thanks for the steps. I only know how to make papaya salad, somehow it is like a white spaghetti with a sweet and sour taste. I would probable try this squash spaghetti one of this days.